Breaking the traditional, flavor-constricting forms of other French presses, Osaka designed its brewer with an innovative, patent-pending mechanism that gives the user complete control over the extraction process. The result? Consistently smooth, grind-free coffee. Developed in collaboration with a team of coffee enthusiasts and technicians, the Osaka French Press launched on Kickstarter today with a $50,000 funding goal. Osaka provides drinkers with grind-free coffee consistently brewed to perfection. This French press stops the brewing process upon your liking, while seamlessly separating out the grinds from the brewed coffee. Osaka features an adjustable airlock for slow or fast brewing, preventing excess coffee grounds from seeping into the beverage. Coffee drinkers can create a light, medium, or dark brew. 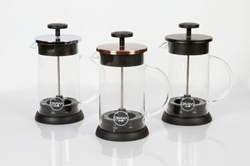 Osaka’s French press is made with a handblown borosilicate glass body to resist shattering from thermal shock, while its silicone base gives it a non-slip grip. The French press is odor-resistant and won’t absorb any chemicals. Osaka also contains a stainless-steel mesh filter to help create an even extraction. In addition to coffee, Osaka has many uses such as brewing tea to perfection and infusing oils with herbs and spices. Early backers can take advantage of backing the Osaka French Press at 60% off its retail price. In addition to coffee, Osaka can also brew tea to perfection, to learn more about this extra feature, visit the campaign page, http://bit.ly/Osaka_KS. With Osaka it is always so much more than design, it is about finding the perfect balance between aesthetics and performance. Since 2013, our product line has been continuously expanding to what we currently carry. But our coffee-enthusiastic designers are developing, tasting and testing many more products and designs that we look forward to delivering to the coffee consumer in the coming year. We are excited to continue to bring beautiful, quality coffee brewers. To learn more, visit https://www.osakacoffee.com/.